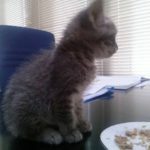 On June 16, Thursday, the gardeners of the Bosphorus University brought me a very cute, about 4-week-old gray kitten. They said that they found in the bush, crying for his mother. When I first saw him, my heart melted . He was so innocent, so tiny, so cute! 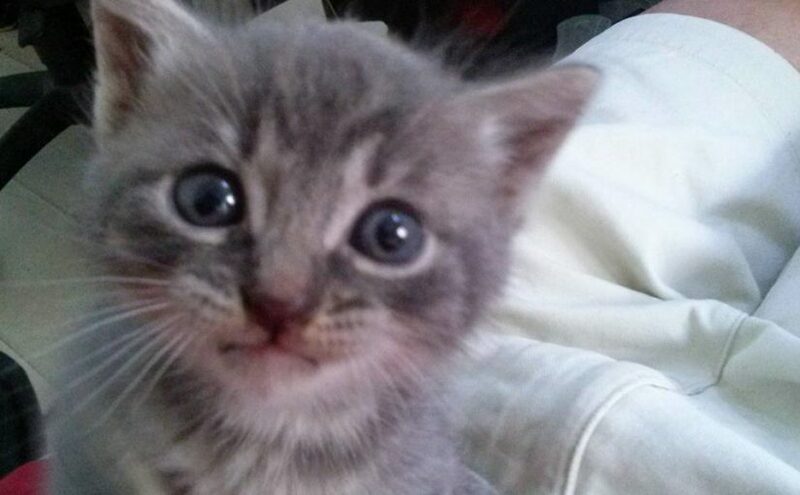 On June 16, Thursday, the gardeners brought me a very cute, about 4-week-old gray kitten. They said that they found in the bush, crying for his mother. The first moments in the office. After I fed him, the baby calmed down. Oh, look at these beautiful eyes! He stopped crying, and started being curious. He is still too young, cannot walk properly. He was so cute, my heart literally melted. After being fed, he started sleeping – and dreaming. He felt asleep in my lap. Sleep baby, soon you’ll have a new family. He was meowing continuously, but after I fed him, he felt better and started playing with me. After a while, he felt asleep. I took him to home – my cats didn’t like it first, but after a while, they got used to him and started playing with him. I advertised in two websites to find him a family. A family from Avcılar wanted the kitten. I took him to them by car, on June 22, Wednesday night. Now he has a new home and a loving family. I am very happy. On Monday, I brought him to office again. … and has a good appetite.